Growing up we went to the beach in Washington state every year for vacation. If you've never been to the coast in the NW it isn't like the beaches in other parts of the United States. The water is cold, rocky and you are likely to get hit by logs if you go too deep. Add in the jelly fish that I had the pleasure to step on more than once and the 60 degree temps in the middle of the summer and it's an adventure. Best of all my mother had a knack for finding in need of a little love motels to stay in. Granted this was the late 80's and early 90's so most of places to stay were a little on the funky side. However, I loved the whole thing! There was something very fun about 'roughing' it on the coast for weeks during the summer. My kids have never stayed in anything other than nice hotels with swimming pools and in a lot of ways it makes me sad. When there aren't televisions and modern day room service you learn all the fun things that make your family great. I remember my dad and I taking day long walks along the beach and my mom teaching me to play rummy. I never appreciated the experiences as much as I should have growing up, but since my mom passed away these are some of my favorite memories. One of my favorite parts of our vacations would be the days we would go into Ocean Shores and stop at the roadside stand that had the best fried clam strips. I adore clams and the beach always meant lots and lots of clams. One year my dad and I had the brilliant idea to go clamming. It went great until we found out we had unknowingly broke the law. There are firm laws on the amount of clams that you can catch, thanks dad! Luckily we weren't found out, but we had to have a large clam bake that year and ever since I have been the number one advocate for not over clamming. My two boys have acquired my love of seafood, especially clams. Since we live inland I am not a fan of preparing what is considered "fresh" (I use the term loosely) clams so I was intrigued when the May issue of Family Circle had a recipe for Spaghetti with Clams using canned clams. This recipe has 8 ingredients. It takes 21 minutes of total time and makes 6 servings. I had no problems finding any of the ingredients at my local grocery store and made no ingredient modifications. For the bacon I used thick cut, my family loves thick cut bacon. Instead of 9 ounces of baby spinach, I used the full 11 ounce container that I bought. I always find that recipes need more than the amount of spinach called for so I thought this was a warranted change. The grocery store which I shopped out was out of minced clams so I substituted chopped clams instead. Finally, I let the pasta cook longer than the three minutes suggested by the recipe. I let the dish cook until all the liquid had reduced almost completely. I followed the remainder of the recipe as written. My kids loved this recipe. They ate their entire servings and then all the leftovers the next day. I loved the taste of the clams and bacon, it was a great combination. 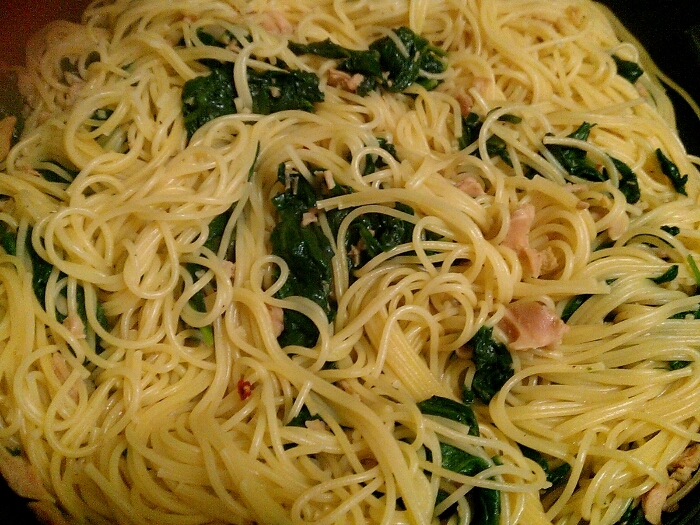 My only complaint was that there wasn't enough spinach for the amount of pasta. This seems to be the norm for many magazine recipes. I would have preferred if this recipe had about twice the amount of spinach. Also if I was serving this just for adults I would definitely increase the amount of crushed red pepper. As the recipe is written it has the right amount for kids, but needs more for adult tastes. Overall, a very easy pasta recipe that was very kid friendly. 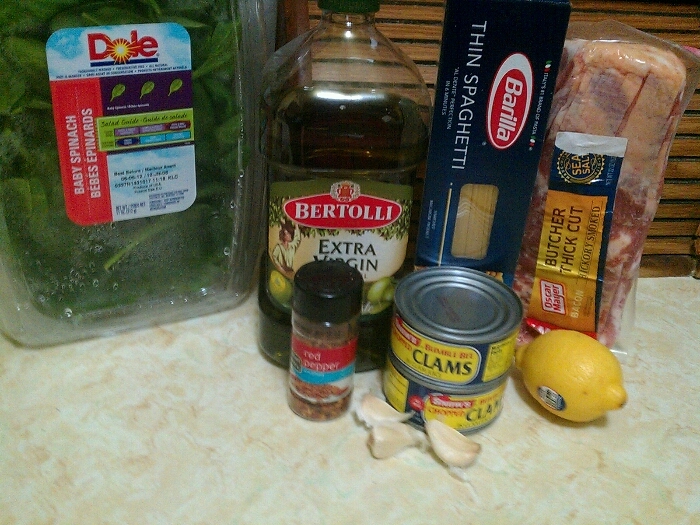 For the recipe go to Spaghetti with Clams. I always find it so interesting what childhood memories are the most vivid for us as adults. I loved reading about the funky seaside hotels and you and your dad's unwitting foray into clamming crime! Excellent! As always your recipe advice is right on! I love spinach and it's actually one of the few greens that my husband doesn't mind, so I say bring it on! I'll double it when I try this recipe. Thanks, Frugal! It is interesting what memories we remember. It's never the ones that involve lots of money etc. I always remember the ones that had fun unexpected moments. Just followed you on GFC. :) Hope I get a follow back. Thank you!